A man from Mexico living in the U.S. illegally has confessed to kidnapping college student Mollie Tibbetts while she was running in her small Iowa hometown, killing her and dumping her body in a cornfield, authorities said Tuesday. Cristhian Bahena Rivera, 24, was arrested and charged with first-degree murder in the death of the 20-year-old Tibbetts, whose July 18 disappearance set off a massive search involving state and federal authorities. "I can't speak about the motive. I can just tell you that it seemed that he followed her, seemed to be drawn to her on that particular day, for whatever reason he chose to abduct her," Rahn told reporters at a news conference outside the sheriff's office in Montezuma, where Rivera was being held on $1 million cash-only bond. 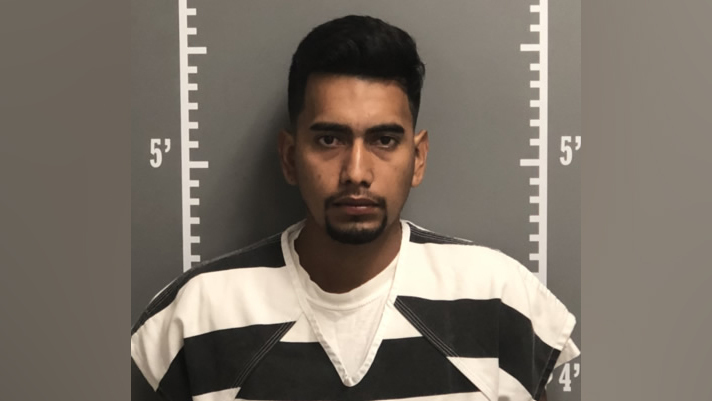 Cristhian Bahena Rivera, 24, was arrested and charged with first-degree murder in the death of Iowa college student Mollie Tibbetts on Aug. 21, 2018. The news that the highly publicized and gruesome crime was allegedly committed by a person in the country illegally drew immediate outrage. President Donald Trump noted the arrest and called for immigration law changes at a rally in West Virginia. "You heard about today with the illegal alien coming in, very sadly, from Mexico and you saw what happened to that incredible, beautiful young woman," Trump told the crowd in Charleston. "Should've never happened. Illegally in our country. We've had a huge impact, but the laws are so bad. The immigration laws are such a disgrace, we're getting them changed, but we have to get more Republicans. We have to get 'em." Iowa's two GOP U.S. senators also described Tibbetts' death as a tragedy "that could have been prevented," and Iowa Gov. Kim Reynolds said residents were heartbroken and angry. "We are angry that a broken immigration system allowed a predator like this to live in our community, and we will do all we can to bring justice to Mollie's killer," Reynolds, a Republican, said in a statement. Trump has made further crackdown on illegal immigration a core policy of his administration. He often has claimed widespread crime by people living in the country illegally, citing among other things the indictments of 11 suspected MS-13 gang members from El Salvador charged in connection with the slayings of two Virginia teens. Trump also has held events at the White House with members of "angel families," whose relatives were killed by immigrants. Although Trump claims legal U.S. residents are less likely to commit crime, several studies from social scientists and the libertarian think tank Cato Institute find that isn't accurate and states with a higher share of people living in the country illegally have lower violent crime rates. U.S. Immigration and Customs Enforcement said that it lodged a federal immigration detainer for Rivera after he was arrested on the murder charge. That move means the agency has probable cause to believe he is subject to deportation. Investigators said they believed Rivera had lived in the area from four to seven years, and Rahn described Rivera as someone who lived in a rural area and kept to himself. Yarrabee Farms, a family-owned company that operates dairy farms in the rolling hills outside Brooklyn, said that Rivera had been an employee in good standing for four years and that it was shocked to learn he was implicated in the crime. The company is owned by the family of Craig Lang, a prominent Republican who previously served as president of the Iowa Farm Bureau. A search of court records revealed no prior criminal history for Rivera in Iowa, and it's unclear whether he had ever been subject to prior deportation proceedings. Rivera's Facebook page described him as being from Guayabillo, a community of less than 500 people in the state of Guerrero. It's about a three-hour drive from the resort city of Acapulco. "The defendant further described during the interview that he dragged Tibbetts on foot from his vehicle to a secluded location in a cornfield," the affidavit said. Investigators said they had earlier searched the area for Tibbetts but didn't find her, noting the body was covered by corn stalks when recovered early Tuesday. Rahn said that Rivera was cooperating with investigators and speaking with the help of a translator. He said an autopsy would be performed on the body Wednesday by the state medical examiner's office, which would assist investigators in understanding whether Tibbetts had been assaulted or tried to fight him off. Rivera's initial court appearance is scheduled for 1 p.m. Wednesday in Montezuma. A conviction on first-degree murder carries a mandatory sentence of life in prison without parole in Iowa, which doesn't have the death penalty. On Tuesday night, deputies were guarding a trailer where the suspect had lived on a gravel road outside Brooklyn near a dairy farm. Tibbetts' disappearance set off a massive search involving dozens of officers from the FBI, as well as state and local agencies. They focused much of their efforts in and around Brooklyn, searching farm fields, ponds and homes. Investigators asked anyone who was around five locations, including a car wash, a truck stop and a farm south of town, to report if they saw anything suspicious on July 18. "It never crossed our mind that she wouldn't come home safe," she said. The University of Iowa mourned the loss of Tibbetts, a psychology major who would have started her junior year this week. "We are deeply saddened that we've lost a member of the University of Iowa community," said university official Melissa Shivers, who urged students to seek counseling and other support services as needed. Rahn said he met with the parents and other relatives of Tibbetts to inform them of the arrest Tuesday. He told them that the investigation revealed that they had "raised a great daughter." "We got to know Mollie," he said. "She was a phenomenal individual." Tibbetts aunt Billie Jo Calderwood posted a statement on her Facebook page following the arrest of Rivera reading, "Please remember, Evil comes in EVERY color. Our family has been blessed to be surrounded by love, friendship and support throughout this entire ordeal by friends from all different nations and races. From the bottom of our hearts, thank you." Tibbetts, a psychology major originally from Oakland, California, would have started her junior year this week in Iowa City, about 50 miles east of Brooklyn. She was staying with her longtime boyfriend and working while home from school over the summer.